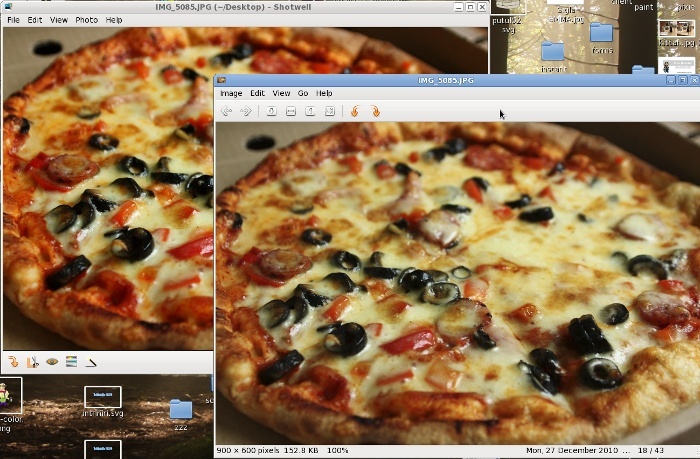 Thew default image viewer in an XFCE environment is a small, lightweight app called ristretto. It brings along two XFCE-specific dependencies when installed: libxfcegui4 and thunar. Apparently something is broken with color profile support in your apps. I never had problem with EOG. It just apply profile set with xicc or gcm-prefs. GIMP and Firefox works after manually supplying .icm file in settings. Don't know about other apps. BTW, that photo made me hungry. Did you try geeqie (was: gqview)? I see no difference between the colors of EOG and Shotwell. You know that a new release of shotwell just came out, right? Have you tried it out? I see you've put some thought into the Shotwell photo viewer... would you consider opening these items as enhancement tickets in the Yorba database? @SEJeff: if is not yummable, then is of little use, will have to wait a while. When my Mom first got her camera, she wanted to crop and reduce the bytesize of a few pictures (for emailing). It was hard as heck to figure out how to do this on Ubuntu. It took me a few hours. I installed imagemagick for resizing and cropping. That was easy to learn, for someone familiar with the commandline. But "Dear Mom: meet the commandline" -- that's not really feasible. Even an experienced computer user would not likely be able to learn GIMP quickly. And it's usually overkill for simple tasks. You should try geeqie, formerly gqview, if you can. One handy feature of gqview is an easy to manipulate right click menu which can be used to hand off a selection of files to commonly used custom scripts. Drag and drop works with both KDE and Gnome, perhaps even with KDE's sftp kio but it has been a while since I tried. Image quality and dithering can be set to match your standards. Built with C++ and GTK gqview and its child are both fast. Gqview seems to be distributed with Fedora and so does geequie. Geequie has replaced gqview in Debian testing but was not ready for Lenny. PS @crf - "mom meet the right click menu I set up to resize and email your pictures" works nicely. @crf, the send to option is available in shotwell 0.8 and eog as a plugin. For nicu's problem about exif information, it is displayed on the bottom left of the window. It may not be complete, it's already a good start. Shotwell clearly has an odd ui (progress bars are inconsistent, custom icons and colors, etc) but its development pace is pretty impressive. @rodgersan: The photo information is only displayed in full Shotwell mode. If you use "direct" mode, i.e. you double click a JPG file, it opens up a small EOG-like window. Currently, that window doesn't offer photo info, among other features. For viewing and simple jobs like manual cropping and resizing I'm actually using gthumb (s.o. suggested that already a few comments earlier). What I lately found on my travelings into the Deep-Net-Space is a program called fotoxx that not only is a very IrfanView-ish lookalike but also features a huge load of image editing and processing functions (similar to IrfanView), too. i also used to use gThumb for small tasks... loved its export to web album and used it often. now it was simplified and made useless.